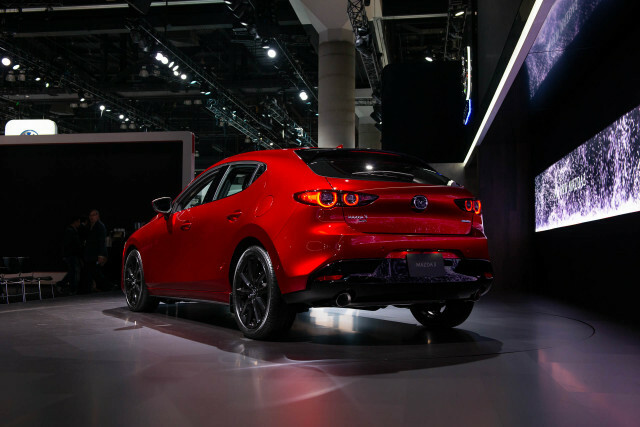 Mazda has revealed its 2019 Mazda 3 compact car, in new-generation form, at the 2018 LA Auto Show. It’s not surprising, given the brand’s go-it-alone strategy this decade, that the new ‘3’ appears to take a different path than key global compact-car rivals in nearly every respect, ranging from design to driving traits to what’s under the hood. 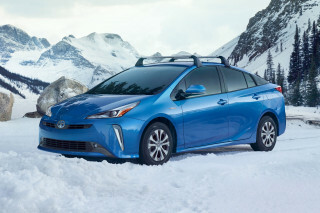 While that’s left the brand’s products very distinctive from the driver’s seat, it’s left the efficiency-focused automaker with a number of predicaments regarding how to meet impending zero-emission vehicle regulations and the demand for electrification. 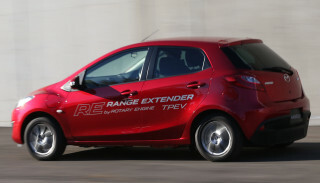 Mazda claims that the new 3 was engineered to provide driving pleasure in everyday situations like driving to work. 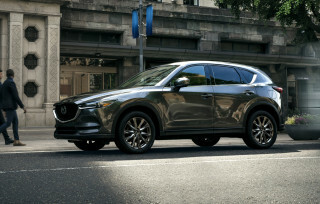 With its new Skyactiv-Vehicle Architecture, Mazda claims to have incorporated the motion of people in motion, when walking or running, in the way that its whole vehicle architecture is set up, in everything from driving position to the suspension. Mazda used a clean, less-is-more theme for its interior design. 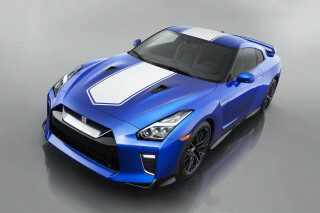 Options for the interior include Greige fabric or burgundy red leather. The centerpoint of the dash is a new 8.8-inch-wide display that teams with the carmaker’s so-called commander control, to allow screen selections without having to reach forward and touch the screen. 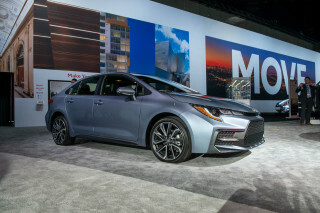 While the sedan looks trim and sporty, the hatchback plays with some unconventional proportions, and we look forward to seeing it in person. The front pillars are thin while the rear pillars in hatchbacks are almost cartoonishly thick, giving the rear portion of the vehicle visual heft. 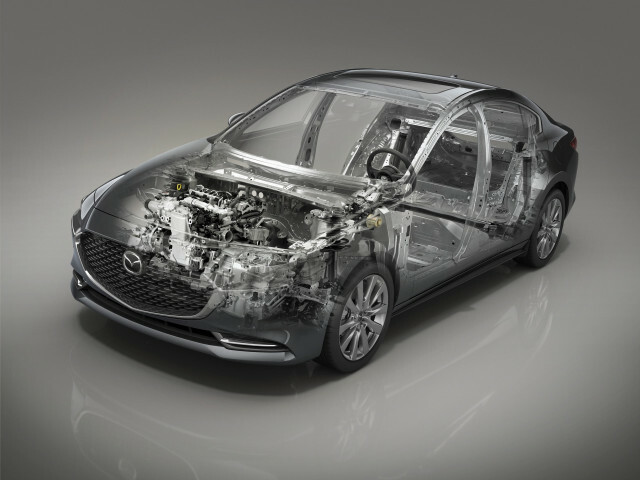 The Mazda 3 will offer available all-wheel drive for the first time, as well as an improved G-Vectoring Control Plus system that modifies the car’s yaw moment with the brakes for improved stability at higher speeds or in emergency maneuvers. Mazda has confirmed that it will launch in the first half of the year, with a 2.5-liter Skyactiv-G inline-4 and manual or automatic transmissions. 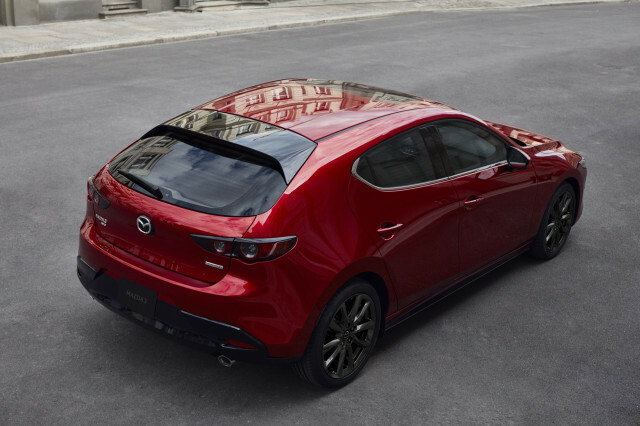 While a 2.0-liter Skyactiv-G inline-4 may be available sometime in the future, the more definitely (and more eagerly anticipated) part of the Mazda 3's future is the Skyactiv-X engine, which will join the lineup later in the 2019 calendar year. Skyactiv-X tech lets the gasoline engine operate like a diesel, using only engine compression, to ignite the fuel in one mode, with the capability to switch seamlessly to spark ignition for other conditions. The potential is for much-improved emissions at light loads, and Mazda says that it allows lower gears and higher revs that accentuate performance without sacrificing emissions or fuel economy. This post has been updated to reflect some clarifications Mazda made about the U.S. version and its timeline.